RMS Queen Mary has been docked at Long Beach, southern Los Angeles. since 9 December 1967. The City of Long Beach had won an auction for the great liner and saw it as the centrepiece of a revitalised waterside area including the adjacent dome housing Howard Hughes’ ill-fated Spruce Goose. It opened its doors to the public on May 1971 after a major transformation. Queen Mary can never go to sea again, her inside ripped out and even the symbolic three funnels replaced by ones of aluminium. The lifeboats are not the originals either. Long Beach still owns the ship but in very recent times it has a new investor/leasee, Urban Commons, a large Los Angeles-based privately-owned investment house. The future looks bright. Let us put everything into perspective. It has not always been easy sailing for the old lady, even in the Californian sunshine, enthusiasm sometimes getting in the way of commercial sense. Three previous operators. There is however a feeling that the bad times are behind with Urban, and Carnival Corporation now established in the dome as a cruise terminal. Howard Hughes' aircraft has long gone to the Evergreen Aviation & Space Museum in McMinnville, Oregon. Carnival owns the current QM2, a success story in its own right and a true successor. 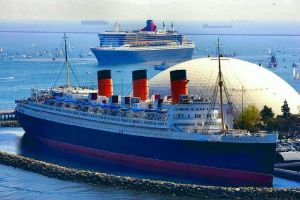 If you are in Los Angeles, Queen Mary is very easy to get to by road or public transport, and 20 miles from LAX. There is a courtesy bus transfer from the City of Long Beach including the metro station. Owning a large and, sadly, deteriorating ship is not easy or cheap. Various US battleships are expensively preserved (USS Iowa is moored on the LA waterfront just seven miles away. There is a combined-visit ticket available). In the UK, the light cruiser HMS Belfast is maintained at a vast outlay and in the Netherlands the Holland America liner Rotterdam is a hotel. We still do not know the fate of QE2, still in Dubai, and the sad tale of SS United States is noted in this issue. With Queen Mary, things are moving ahead and renovations of each of the 346 original First Class staterooms and nine suites are under way including new furniture, carpet and lighting. Urban is collaborating with Brintons, the British manufacturer of carpets and designer of some of the original carpet on-board Queen Mary, to recreate patterns from that era. “Our goal is to channel a new aura of regal elegance while maintaining the ship’s cherished historic elements. We intend to stay true to the original art deco design of the ship by working with various manufacturers to emulate and modernise different patterns, designs and furniture. Through this process, we will work closely with the ship’s historical adviser to ensure we meet certain historical requirements,” said Taylor Woods, principal of Urban Commons. Guests at the hotel are welcomed by White Star-liveried footman. No customs of course and an elevator on the quayside quickly takes you up to reception. The suites themselves are grand but balconies were not for the North Atlantic. A porthole is provided. Naturally, room service is available. En-suite facilities include flat screen TV, iPod docking and wi-fi, all beyond the imagination of travellers when she was in her prime. Visitors can of course visit the wireless room and see how communications were maintained at sea. As part of your Queen Mary experience, a fine self-guided walking tour is provided in various languages. Or you can join the regular tours which also take in the sumptuous swimming pool. Allow up to three hours. A current display, in a beautifully renovated gallery space, is the Passion for Painting: The Art of Winston Churchill Exhibition. It offers a unique opportunity to view paintings rarely seen in North America by our renowned wartime leader, and sometime painter, and one of the most illustrious passengers of the Queen Mary. It brings together 10 paintings from the family collection of his late grandson Julian Sandys, and from the National Churchill Museum at Westminster College in Fulton, Missouri, where he made his famous “Iron Curtain" speech. The exhibition surveys both Churchill’s landscapes and seascapes, the statesman’s favourite subject. There is memorabilia galore and video film taken on Queen Mary. 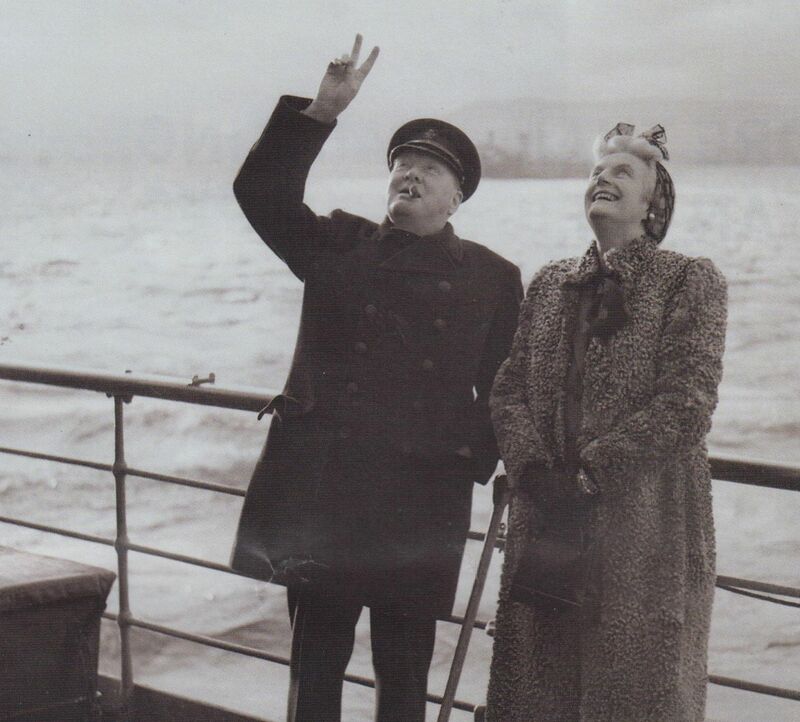 Churchill said that the Queen Mary, and her sister ship Queen Elizabeth, shortened the war. In July 1943, she carried 16,683 troops on a single crossing, a record never likely to be broken. The exhibition runs until December. You can dine in Sir Winston’s Restaurant & Lounge, silver service and stunning seaside views. The rather British award-winning menu includes creative culinary cuisine such as traditional favourites like beef Wellington, chateaubriand and rack of lamb, each prepared with a contemporary twist. Sir Winston’s also offers the finest seafood, like Dover sole or seared ahi, and has an array of vegetarian options as well. On offer is an extensive wine list and an unmatched ambiance. If it is a quick meal that you want, the Promenade Café specialises in gourmet burgers, seasonal salads and comfort food classics like fish & chips, macaroni & cheese and of course, meatloaf. It opens for breakfast. Another alternative is the Chelsea Chowder House & Bar. Very popular, and on the sundeck, "Diana: Legacy of a Princess" showcases a priceless collection of evening gowns, dresses, personal accessories, photographs, heirlooms and other cherished memorabilia associated with the late princess and the royal family. Adjoining is the Queen Mary Tea Room, with notes explaining the background to the wife of King George V.
One of the most impressive areas is the rear engine room area, which is approached landside and down a series of stairs. The gangways have been well laid out for visitors and one can only imagine how hot this area got when the massive Yarrow boilers were under full power driving the mighty ship forward at 30 knots across the North Atlantic. What is equally fascinating is the company stamp marks on most of the machinery. Components were for the most part made in small factories and workshops within 30 miles of Clydebank (Scotland).